LEO LIFTOFF, is an NBA rookie, rising star, and humanoid from another planet! He left his home planet of Zirconia against his parents wishes to pursue his lifelong dream of playing in the NBA. Before coming to earth, Leo was a Star-Pilot for the Zirconian Air Defense Team. But now some haters from his home planet are determined to bring him down and end his career. Leo must find a way to rise above the haters and the negativity to live out his dream of playing in the greatest basketball league in the universe. PRINCE BUZZO, is the ruthless and spoiled humanoid prince from the planet Zirconia. He is also a huge basketball fan and sneakerhead, who is jealous of fellow Zirconian, Leo Liftoff's new-found success on earth playing in the NBA. So he’s devising a plan to destroy Leo's career, and end the game of basketball on earth—just so he can start a basketball league of his own on Zirconia. COMMANDER GLEEK, is the clever and vicious leader of a ragtag band of Scrubazoid outlaws. Scrubazoids a.k.a. Scrubz, are dangerous little cat-like alien creatures known for being thieves and vandals. Gleek will join forces with Buzzo and help attempt to destroy Leo's career, bring an end to basketball on earth, and become the Elite Squad’s #1 enemy in the process. THE ELITE SQUAD, are six basketball-fanatic friends, who are recruited to be a top-secret team of specially-trained space-alien hunters. 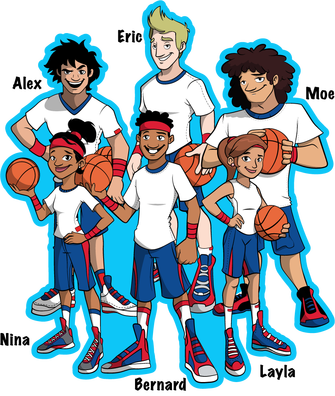 Disguised as NBA ball boys and girls, they take on the responsibility of saving the game of basketball on earth from being destroyed by a mysterious and diabolical space-alien threat.